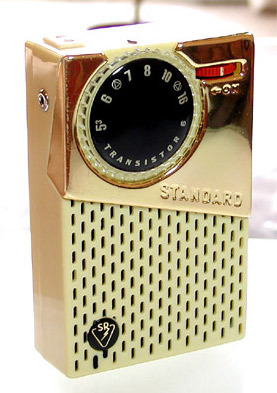 Another sweet "pocketable" radio from Standard, the SR-F23 went on sale sometime in late 1957 at a list price of 12,300 yen. The circuitry and mechanical features are essentially the same as the SR-F22. 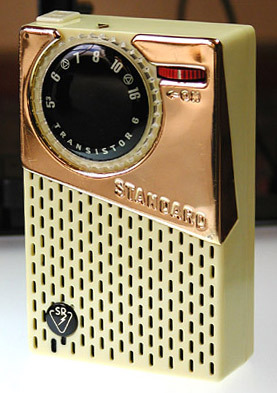 However, the gold plated metal escutcheon, larger tuning dial of a different style, red volume control knob, and funky round "SR" logo floating on the plastic speaker area create an entirely different expression that gives this radio its own unique presence. According to the maker's original ad flyers, the SR-F23 was available in three colors  ivory, gray, and maroon. Maybe some day we'll learn why there seems to have been so few of these produced (or sold). [08.01.04] Update: I added the list price and information on color availability.